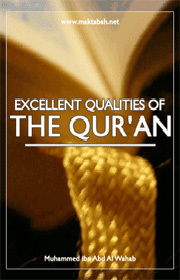 This is an English version of the book entitled Fada il-e-Qur’an originally written in Arabic by the Imam Muhammad bin ‘Abdul Wahab, an eminent Muslim Scholar. This is the translation of the original in easy English language; in presenting the meaning, however, an attempt has been made to be very close to the original. All footnotes are added by the Translator to clarify difficult phrases and words, and to provide the reader with more relevant information. It is hoped that this small book will be of great help to the English speaking reader in his understanding of the Holy Qur’an.